For the interior decorator, see Christopher Lowell. 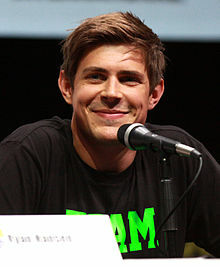 Christopher Lowell (born October 17, 1984) is an American television and film actor. He played the roles of Stosh "Piz" Piznarski in the CW noir drama Veronica Mars, William "Dell" Parker in the ABC Grey's Anatomy spin-off Private Practice, Jeremy Graves on the Epix series Graves, and Bash on the Netflix series GLOW. Lowell was born in Atlanta, Georgia. He attended the Atlanta International School, where he became interested in theatre and filmmaking. He attended the University of Southern California, where he was discovered in his first year while playing beach volleyball. In his spare time, he enjoys amateur filmmaking, theatre, and traveling. Discovered in 2003 after going through his first major audition, he landed a role on the ABC teen drama Life As We Know It. Of the show's trio of male characters, Lowell portrayed Jonathan Fields, the "least confident but most creative and grounded of the three". The series was cancelled after 13 episodes. In 2006, Lowell had lead roles in the coming-of-age film Graduation and also in a small film entitled You Are Here. After the end of Life As We Know It, Lowell was cast as Stosh "Piz" Piznarski in the third season of Veronica Mars, opposite Kristen Bell and Jason Dohring. From 2007 until 2010, Lowell appeared in the ABC drama Private Practice, alongside Kate Walsh, Audra McDonald, and Tim Daly, playing Dell, the receptionist for the Oceanside Wellness Group who is also a qualified nurse, midwife-in-training, and young father to six-year-old daughter Betsy. Lowell exited Private Practice in the show's third-season finale when Dell died from heart failure, a complication during brain surgery after a vehicle accident. In 2011, Lowell played the role of Stuart Whitworth in the film The Help, an adaptation of Kathryn Stockett's 2009 novel of the same name. The following year, filming began on Lowell's directorial debut, Beside Still Waters. Set in Michigan’s Upper Peninsula, the film tells the story of a man redefining his outlook on life after the death of his parents. Lowell also played Derrick on Fox's 2014 comedy, Enlisted. Chris is currently starring in the Off-Broadway hit, Jacuzzi, playing through November 15 at Ars Nova in New York City. 2007 Grey's Anatomy William 'Dell' Parker Episode: "The Other Side of This Life: Part 1"
Episode: "The Other Side of This Life: Part 2"
^ a b c d "Chris Lowell: Jonathan Fields On Life As We Know It". Archived from the original on 2006-11-12. ^ "Life As We Know It". Archived from the original on 2007-06-27. ^ Fanbolt Forums. "Life As Know It #2". Archived from the original on 2006-12-11. ^ Periyasamy, Winn (June 1, 2012). "Chris Lowell Making Feature Directorial Debut on 'Beside Still Waters'". The Film Stage. Retrieved July 8, 2013. ^ Herman, Jennifer (April 19, 2012). "A new film that takes place in Michigan will be shot in metro Detroit and Traverse City". E. W. Scripps Company. WXYZ-TV. Archived from the original on October 14, 2013. Retrieved July 8, 2013. ^ "Two Shots for Poe's Myspace". This page was last edited on 3 February 2019, at 03:43 (UTC).